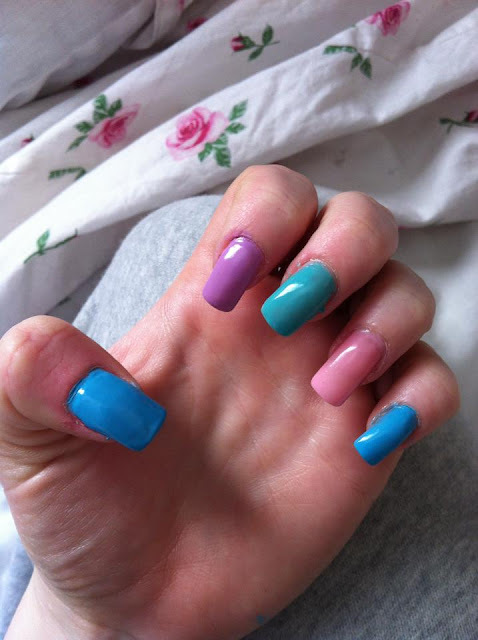 Sophie says..: March Obsession: Candy Coloured Nails! It's no surprise that candy colours have become the go-to trend this year, with the Queen's trademark pastel two pieces making regular appearances in our magazines and on our television sets due to her Jubilee Tour. So here's my contribution, candy nails! I used mint for my middle finger as it's by far the best of the pastel colours this season, and it's always great to go back to your inner-child and paint each nail a different colour like I know I used to when I thought that wearing as many different colours as possible was the key to good style! Barry M is by far the best place for pastel nail paint, and you could even go one step further by painting your nails white and then applying some pastel nail crackle on top?